The last time I reviewed a stand alone GPS data logger it was the GlobalSat DG-100, a functional but not very stylish box for recording GPS tracks. The new i-gotU GT-600 GPS Travel & Sports Logger from Mobile Action (disclosure: they sent it to me for free) has the same SiRF Star III chipset as the DG-100, but it comes in a smaller and more attractive package. You’ll want a GPS data logger if you want to record your travel and sports tracks (walking, running, cycling, sailing, etc) and tag your photos with their GPS locations. Recording this GPS information will allow you to examine your route on the computer later on, and see exactly where you were when you took your photos. The GPS measures just 46×41.5x14mm and weighs only 37g. It is made of shiny white plastic, and there is a soft plastic case around it (presumably to protect it if you drop it). Here is what the packaging looks like from the front and back. And this is what is inside the packaging. 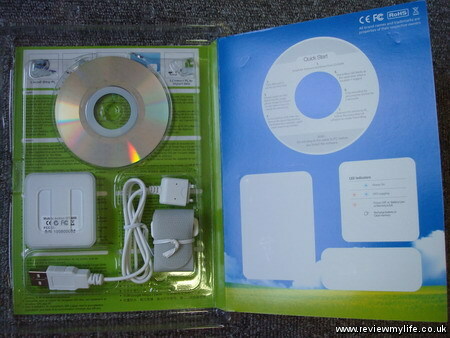 You get the GPS data logger, a USB cable, a velcro strap, and a mini install CD. If you have Windows 7 you won’t need the CD – you will have to download the software from their website. Here is a closer look at the sides of the unit. On one side is the cable connection, and on another there is a hole which you could use to attach a wrist strap. Here is the underside of the unit, the holes in the casing are there for you to feed the velcro strap through. The velcro strap allows you to attach the GPS unit to your rucksack, bike, boat, etc. Ideally you should have the unit positioned so that the front faces clear sky. Here is the unit strapped to my bike, ready for a cycle around the city. There is only one button on the GT-600. Just hold it for a few seconds and a blue LED (under the plastic) will light up. You then need to wait for 30-60 seconds for it to get a lock on the satellites. How long it takes depends on how many satellites are above visible from your current location, and also on cloud cover. In ideal circumstances it could get a lock in about 30 seconds. The time will also be reduced if it was on in the last few hours as it will still know the positions of some of the satellites. Once it has a lock then both the red and blue lights will start flashing. Once it starts recording you can do whatever you want; Walk, run, cycle, sail, and it will log your position every 5 seconds. The unit is water resistant so it should be ok to use in the rain. Remember to check the unit’s flashing lights regularly to make it is still recording. It can be very annoying if you get home and realise that only half your journey was recorded because a thick cloud or other GPS signal blocker stopped the unit from logging your GPS tracks. The battery lasts about 30 hours if you log every 5 seconds (longer if you increase the logging interval) and is charged by the same USB cable that you use to transfer the GPS data. The unit can store 262,000 way points (locations) so if it is logging every 5 seconds this will be enough for 363 hours GPS tracks. More than enough for most adventures! 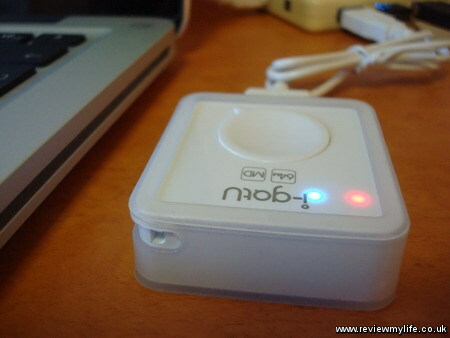 To make the battery and memory go further it has a motion detector built in. If you are still for a while (perhaps you have stopped for lunch for example) it will stop recording. They claim that this will give you an extra 20% logging time. Holding the button for a few seconds will turn the unit off. Because the button is easy to press I’d recommend that you don’t keep the unit in your back pocket. If you do you may well accidently turn it off when you sit down, or bend over. Either keep it strapped to your rucksack, bike, or clothing using the strap, or be careful to place it so that the button won’t be pressed. I find it works fine when put in the front pocket of my rucksack. The logging might now be quite as accurate as it would be if it had a view of the clear sky, but it is good enough. To sync your data to your PC you just plug it in via the USB cable and start up the @trip PC software. 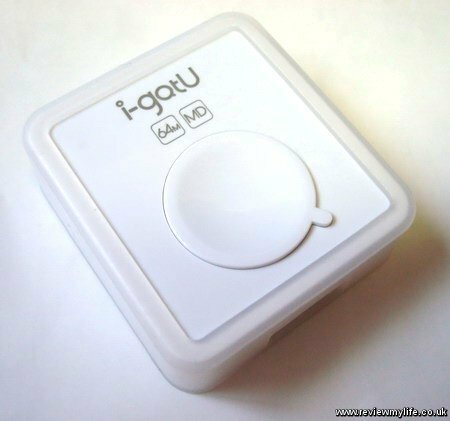 The i-gotU GT-600 GPS data logger comes with three pieces of software. @trip PC – which is the software you’ll want to use if you want to manage your trips and geotag your photos. Sports Analyzer – which shows your GPS tracks in a view that allows you to easily see average speed, calories burned, and when you did each of your activities. Where I am – which simply shows you where you are now on a map. I’ve mainly been using @trip PC. After importing the GPS tracks you have the option to create a ‘trip’. A trip can consist of one or more GPS tracks along with the associated photos. If you have synced multiple tracks you can go back and create new trips for the other tracks later on without having to sync again. You can choose which photos you want to include in the trip. When you’ve chosen them the software can add GPS location information into the image. After creating the trip you’ll get something a bit like this. It shows you the route you took, and the locations of all your photos. You can ‘play’ the trip and watch a moving icon go along your route. The photos you took will pop up as the icon reaches them. You can customise the look of your trip. The view above is the basic view, and the one below is a sporty view which shows a graph of your speed and a few sporty facts about your trip such as total distance, and average speed. 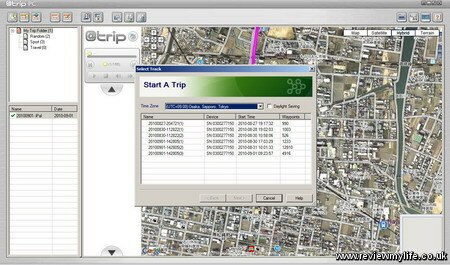 The @trip PC software is easy and quick to use for viewing your tracks and tagging your photos. The main thing it lacks is an sensible way to delete rogue way points (sometime you’ll want to manually clean up your tracks a bit). You can get a list of all way points, but when you have thousands of them it can take several minutes to find the one you want. The software should ideally let you select one or more way points by clicking on them to allow speedy moving or deletion. In the version of the software I used (2010.06.09) there were some UI annoyances, and other problem such as slow syncing, and unreliable communication with the hardware – on my Windows 7 machine if you have done a sync, you can’t delete the data on the device unless you unplug and replug the device back in – you get a ‘Failed to clear log data. (Error=4)’. But you can work around all these issues. If you are only interested in sports tracking and aren’t going to geotag any photos you can use the Sports Analyzer software instead. This is a simpler interface which just shows you your tracks along with speed, distance, calories burned etc. Using the @trip PC software there are some advanced options you can configure. You can set the GPS unit to only record at certain times of the day. And you can set how frequently the unit logs your position. If you don’t just want to keep your trip to yourself you can share it with just a few clicks. The @trip PC software can upload your tracks and photos to the @trip server. You have the option of uploading the photos to the @trip server (it will shrink the photos for you), flickr, or Picasa. Your free @trip account only give you 100mb of space on the @trip server so I’d recommend creating a free Picasa account to your save your @trip account space for the GPS tracks. A Picasa account will give you 1024mb of photo space. Or if you already have a paid flickr account then that will be best as you can store unlimited photos there. Here is the @trip interface showing some trips that I uploaded (one public, one private). Once uploaded to the @trip server you can view the trip in a flat Google Maps view, or by using a 3D Google Earth view – this will be great if you are recording your mountaineering, or hand gliding adventure. Rather than just looking at a static image of my @trip account your can have a look at the real thing showing a trip I made to Naoshima Island in Japan. There is an option on the @trip server that allows you to embed a trip in your blog, such as I have done below. This is a good GPS data logger with a long battery life, and large memory. The unit is small, easy to use, and has worked reliably during my two weeks of testing. 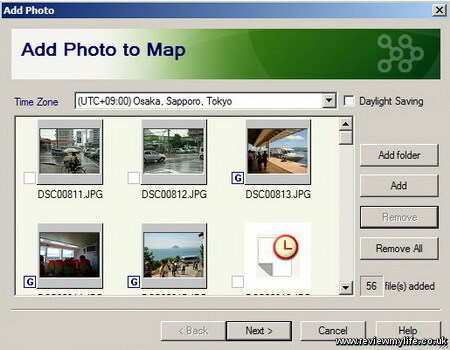 The software makes it very simple to view your trips on your PC, geotag your photos, and share them all on the internet. I’m just hoping they release a software update to sort out the minor problems and bugs that I found. If you are in the UK the GT-600 is available from this seller on Amazon, but last time I checked it was slightly cheaper from Maplin. For more comprehensive information on where to buy the GT-600 around the world see Mobile Action’s – Where To Buy page. I started having a problem where @trip PC suite would not load (at all). But Sports Analyzer still loaded. I tracked it down to a corrupt sub folder in this resource directory – C:\Users\[username]\AppData\Roaming\Mobile Action\atrip\Resource. If you are having this same problem and want to try to track down which folder is corrupt. Backup the whole resource folder (C:\Users\[username]\AppData\Roaming\Mobile Action\atrip\Resource) so you can restore it later. Rename one of the sub folders in this directory and try restarting @trip PC. The corrupt one will probably be one of the ones you’ve edited most recently. Repeat until you find the corrupt one. You have found the corrupt one when @trip PC starts. However you’ll now see that in @trip PC all the trips belonging to the resource directories that you renamed have disappeared. Now restore the whole resource folder from your backup, and then delete the corrupt sub folder. Restart @trip PC and you should have all your trips back (minus the corrupt one). You’ll have to recreate the corrupt trip if you want it back. An extra bit of info if you are digging deeper: A list of the sub folders is stored in C:\Users\[username]\AppData\Roaming\Mobile Action\atrip\Resource\RESOURCE_INFO.INI. When you successfully manage to load @trip PC again it will delete the entries for the folders that you renamed. You need to restore from your backup (point 5 above) so @trip PC knows about the non-corrupt sub folders that you renamed. For over two months now I’ve been the owner of two different GPS devices, and I’ve had plenty of time to thoroughly use them whilst on my London Underground tube walking project, so I thought it was about time I reviewed them. Both are headless GPS units – in other words neither have a display. And both are based on the SiRFstar III chipset. This chipset features a 20 channel receiver, meaning that in theory it can lock onto 20 satellites at once. In reality you are unlikely to be in view of more than 10 satellites at any time. One of the devices is the GlobalSat DG-100 GPS data logger, the other is the Nokia LD-3W bluetooth GPS module. The first device I bought was the Nokia LD-3W. This is a very small unit, not much larger than a thick keyring. It is one button to turn the device on / off, and a socket to allow it to be charged. On its own this device is completely useless. To use it you need some bluetooth hardware and software to connect to it. I had bought it to use with my Nokia N80 smart phone . Nokia provide some really good free software that can connect to these kind of bluetooth GPS units. Sports Tracker is an application for Nokia Series 60 (S60) based phones. It is produced by the Nokia Research Center. 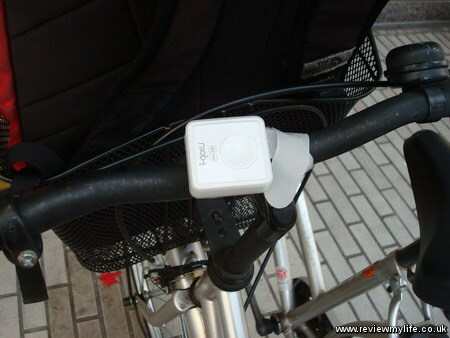 It will record your GPS tracks as you walk, drive, run or cycle. It has features to store your tracks and if you are into doing laps on a circuit it can keep track of your performance when you exercise. Stored tracks can be exported to your PC for analysis as GPX and KML. Your KML tracks can easily be overlayed onto Google Maps imagery so you can see where you have been. One cool feature is that as you are travelling you can see the track as a line on your phone display (but without a map underneath). You can also see statistics such as your speed, and you can see graphs of the data. Nokia Maps is a free application that allows you to browse maps of many of the world’s countries. All the maps are free. They can downloaded on the fly if you have a fast data connection on your phone. This can be very slow so I’d recommend that you use the Nokia map downloader application to put whatever maps you want onto your phone’s memory card. The maps are fairly basic but this is a very useful tool if you are lost. Nokia Maps connects easily via bluetooth to the LD-3W. Once the GPS signal has been acquired the LD-3W is good at keeping track of it. I’ve found that the unit can keep track of a good signal when the unit is in my rucksack, a car, train and even sometimes indoors. The big problem (which also affects the GlobalSat DG-100) is that it can take a while to acquire the initial signal when you first turn it on. If you try to acquire the signal whilst on the move then it can take ages – I’ve walked around for 10-20 minutes with the GPS units and not got any signal. I’ve found that to get the initial signal you really need to be stationary. What I now do is to place the unit on my window sill for a few minutes before I go out. This trick works well for both units. With the LD-3W you’ll need your bluetooth device nearby to initiate the GPS search. In the box of the Nokia LD-3W is the GPS module and a car charger. Unfortunately there is no mains charger. It charges using the Nokia mini phone charger. Fortunately this is the same charger that came with my Nokia N80 so I was able to use that. The box claims that the Nokia LD-W3 has up to 22 hours of operating time and I have no reason to doubt this. The problem is that you won’t be able to use the GPS module for this amount of time with a Nokia phone. Connecting to the GPS module by bluetooth burns the phone battery at a very fast rate. If you use it continuously you will probably get up to three hours of usage before your phone battery is used up. The GPS unit will keep going after this but it is useless without something to connect to it. 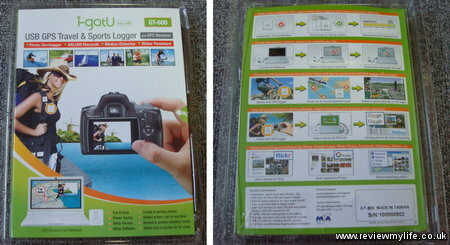 The GlobalSat DG-100 data logger is the second GPS device that I bought. I bought it when I realised that the N80 + LD-3W combination didn’t have enough battery power (the battery problem is with the N80) to be able to record a whole day’s walking route. The DG-100 is a standalone data logger. When you turn it on it starts recording your positions. When you turn it off it stops. It doesn’t need to connect to any other device to be used. When you’ve done you days walking, running or driving you can connect it to your PC via its built in USB plug. You can then save the tracks in a variety of formats such as GPX and KML. The supplied software is a bit weird but fortunately someone has written a better piece of software called DGManager that you can use to sync your tracks. DGManager will also allow you to GPS tag any photos that you have taken along your way. Below is an example of a track recorded with the DG-100 and then exported as KML using DGManager. The tracks from the Nokia LD-3W would look the same. The unit can be configured to record points at different intervals. It can store up to three different recording settings, which can be selected using a switch on the side. It can store a lot of tracks. The unit claims up to 60,000 waypoints which at the default recording setting of once point every 15 seconds would mean that it could store 250 hours of tracks. The battery life is up to 30 hours. The unit charges via the USB port. It comes with two rechargeable AA batteries. This is good as it means that you can carry a spare set of standard AA batteries with you if the unit were ever to run out of power whilst you are on the move. It is hard to find real fault with the DG-100. It is not the most amazing looking piece of kit but that doesn’t matter. The supplied software isn’t great but that doesn’t matter either as someone decided to write their own software – DGManager. It does its job and it does it well. You turn it on and once it has acquired the GPS signal you can leave it and go for a walk, cycle, etc. When you come back your tracks are ready for you on the device. If it has a good signal (i.e. on a clear day) you can even put it in a front pocket or a rucksack and it should still be able to keep the signal – but if you do this I do recommend you check it regularly to make sure it is still tracking. As I’ve reviewed two different devices and you’d expect me to tell you which is best. The problem is that they both serve different purposes. If you want a GPS module to allow you to look at maps on your Nokia phone then the Nokia LD-3W is a well suited. If you want to be able to record your tracks as you explore then go for the GlobalSat DG-100.